What is flatfoot? Flatfoot is often a complex disorder, with diverse symptoms and varying degrees of deformity and disability. There are several types of flatfoot, all of which have one characteristic in common—partial or total collapse (loss) of the arch. The term “flexible” means that while the foot is flat when standing (weight-bearing), the arch returns when not standing. In the early stages of flexible flatfoot arthritis is not restricting motion of the arch and foot, but in the later stages arthritis may develop to such a point that the arch and foot become stiff. Activity Modifications Cut down on activities that bring you pain and avoid prolonged walking and standing to give your arches a rest. Weight Loss If you are overweight, try to lose weight. Putting too much weight on your arches may aggravate your symptoms. Orthotic Devices Your podiatric surgeon can provide you with custom orthotic devices for your shoes to give more support to the arches. Immobilization In some cases, it may be necessary to use a walking cast or to completely avoid weight-bearing. Physical Therapy Ultrasound therapy or other physical therapy modalities may be used to provide temporary relief. Shoe Modifications Wearing shoes that support the arches is important for anyone who has flatfoot. Surgery In some patients whose pain is not adequately relieved by other treatments, surgery may be considered. 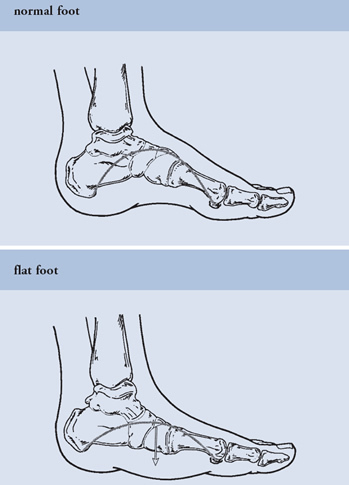 A variety of surgical techniques is available to correct flexible flatfoot. Your case may require one procedure or a combination of procedures. All of these surgical techniques are aimed at relieving the symptoms and improving foot function. Among these procedures are tendon transfers or tendon lengthening procedures, realignment of one or more bones, joint fusions, or insertion of implant devices. In selecting the procedure or combination of procedures for your particular case, the podiatric surgeon will take into consideration the extent of your deformity based on the x-ray findings, your age, your activity level and other factors. The length of the recovery period will vary, depending on the procedure or procedures performed.